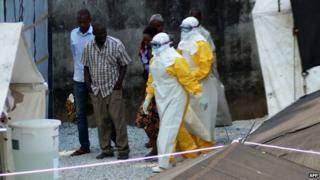 The deadly Ebola virus has killed seven people in Liberia's capital, Monrovia, health officials have said. These are the first deaths reported in the city since the outbreak of the contagious virus in several West African states. Among the dead are a nurse and four people from the same household, including a baby, officials said. Guinea has been worst-affected by Ebola, with 208 deaths since the outbreak was first reported in March. There is no cure or vaccine for Ebola - one of the world's deadliest viruses. Liberia's Deputy Health Minister Tolbert Nyenswah said the nurse died on Saturday at the state-run Redemption Hospital in the densely populated township of New Kru Town, west of Monrovia. "When we knew that the nurse was confirmed [to have] the disease, we isolated her and started to provide protective treatment and supportive treatment and all of that to her. But unfortunately she died," Mr Nyenswah said on local radio. A woman who came from Sierra Leone had also died in Monrovia of Ebola, he said. She "infested some people in the household", causing the deaths of the baby and two other people, Mr Nyenswah said.